One single weapon can insure the security of the United States of America: technology. Today, our country’s safety depends on a fortress of impenetrable files, borders built of megabytes and shields of microprocessors. The sharpest minds in our nation’s defense industry conducted an in-depth study identifying a framework for the future of defense manufacturing in light of global changes in the industry since the Cold War. The resulting document, Defense Manufacturing in 2010 and Beyond, Meeting the Changing Needs of National Defense, clearly determined that U.S. forces must possess technological superiority to achieve and maintain dominance. Advanced military-specific information management software will play a crucial role in anchoring that technology. The Committee on Defense Manufacturing authors included professors of aeronautics and astronautics, world-class defense and software engineers, technology consultants and military strategists. Their work identifies future challenges to defense manufacturing and strategies that may surmount them. Five of the most critical issues are presented below. The committee found that production process capabilities and cost databases must be integrated into design systems to provide simultaneous assessments of design alternatives and production costs, manufacturing risks and system design as well as life-cycle cost analyses concurrent with design. Future defense manufacturing success demands vision. Industry leaders will be armed not only with the foresight provided by studies such as this one, but also the ability to see completely into their own operations with a military-specific information management system that can slice through mountains of data to reveal precisely the information necessary to monitor and make decisions in real time. This system should operate like super-powered night vision goggles, seeing into all of your operations at once, revealing every aspect of the complex project lifecycle that is inherent in a military manufacturing environment. The study repeatedly underscores the importance of integration for information management. An all-inclusive software application that unites all operations provides real-time business metrics that enable you to control cost and schedule variance, quality and engineering. Reduced rework, scrap and engineering change orders are realized along with increased requisition and approval speed. Total information integration increases productivity and customer satisfaction. Instead of isolated islands of automation, a defense-specific integrated system will streamline workflow and operations by providing one single, integrated data repository. This global snapshot of all company-wide transactions enables stakeholders to focus on exceptions and variance where immediate attention will realign objectives. A system that has the capabilities to comply with the extensive Defense Contract Audit Agency (DCAA) requirements, every step of the way, will streamline your audit process and keep your company in compliance for future contract opportunities. By using an unlimited work breakdown structure (WBS), you have the flexibility to define each phase, task and sub-task of any project, contract or job. All of your costs, including labor, materials, outside processing, work in process (WIP), overhead and other expenses, are captured at each WBS level for immediate and future analysis. The committee stressed that “intelligent monitoring systems should be developed that can detect current problems and assess the probability of future failures.” Software must be able to warn you when tolerances in budget, quality and delivery might be exceeded, much like an ultra-sensitive radar, alerting you when you need to defend yourself against potential overages. Finding out about possible conflicts when it’s too late to act is not good enough to stay competitive in today’s industry and most certainly will limit your company’s delivery of contracts on-time and within budget. Dominating the defense manufacturing industry in the future will require comprehensive, sophisticated functionality in defense-specific accounting software. Actual transactions must be accumulated and compared against planned for real-time variance reporting and alerts. DoD-specific software is a powerful tool, providing a start-to-finish cost picture that increases your project profitability. Military-specific information systems developed and maintained with leading-edge technology such as Microsoft’s .NET platform is a perfect example. Microsoft engineers created the platform to increase web services capability, improved security and reduced communication barriers between disparate platforms. As one of the least expensive environments, it not only reduces your acquisition cost it also decreases modification and maintenance costs, dramatically lowering your total cost of ownership. The information management system of the future should operate securely on standard, commercially available hardware, software and networks. Software must make sharing of data as well as importing and exporting safe and easy. By using methodologies like the Microsoft open database connectivity interface, .NET and the SQL Server database, sensitive information is kept secure from unauthorized parties via automated tools that reduce security policy deployment times by up to 80%. This dynamic environment demands your company be armed with information management tools that keep you competitive in a changing world. 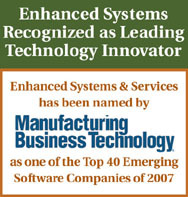 Enhanced Systems and Services, Inc. has a solid history of success in the industry combined with advanced technology ensuring clients achieve and maintain a competitive advantage. Our Finesse ERP software is DCAA-compliant and has been for over 20 years. It is one of very few designed specifically to comply with the complex and exhaustive list of DCAA requirements. Companies like yours have used it to produce jet engines, missiles, deep space telescopes and NASA’s mission-critical propulsion systems. “Defense Manufacturing in 2010 and Beyond, Meeting the Changing Needs of National Defense,” spelled out the challenges our industry faces. Enhanced Systems and Services can help your company provide the answers. Your business is defense. Our business is empowering you to do it more efficiently and profitably, today and in the future. Our software and services provides a completely self-contained, single vendor business tool integrating all operations. It’s the Number One reason our customers choose to conduct business with Finesse.